Now that the cat is out of the bag, I can finally start sharing some style insights I’ve gleaned during my First Trimester, that I hope can be useful to those of you who might be going through it (or planning to in the near future)! In terms of my wardrobe, surprisingly, the first three months proved to be rather challenging. It was like this: I was not showing yet, but my body was changing already in all these ways & felt different – even if not bigger in size necessarily. I still wanted to feel good in my clothes (maybe not as tight-fitting as I might otherwise prefer), but knew that a looser silhouette would be a dead giveaway of my new status, so I wanted to hold off wearing those just yet.. So what to do? Even as a stylist who dresses clients for a living, I found this time to be tricky. What added more difficultly to the equation was that icky feeling that was ever-present in the first trimester – whether it was nausea, extreme indigestion, bloat – whatever it was that day. It made picking out outfits a bigger feat as motivation was just simply lacking. What I found worked best for me was finding some specific silhouettes that weren’t too constricting but still form-fitting, and using styling tricks to create looks that distracted from my mid-section area, creating interest elsewhere. Shirt dress with a belt tied slightly looser + flats or sandals (you can sub for boots in Fall/Winter) + statement necklace. You can throw on a leather jacket if the weather is chilly too (or stylishly drape it across your shoulders). What’s great about a shirt dress is that it typically has buttons that not only make it easier to manipulate width as you can unbutton the top or bottom ones for more room, but they also create a vertical line, which elongates visually. You can also layer the dress on a tank top – and open it in the chest area – using a belt to define your waist and pull the look together. Printed wrap dress + booties or flats + pretty earrings. This one seems like a no-brainer as it’s so comfortable, but what’s also great about a wrap is that it’s totally pregnancy-friendly and can be worn all throughout the 9 months – as the tie of the dress can easily sit atop your bump as it grows bigger. Pretty dangly earrings draw attention to your neck and face – distracting from your bloated mid-section. High-waisted jeans/shorts with a waist-tied tee or shirt + open-toe booties or low heeled sandals. I’ve been able to wear my regular jeans until almost mid-way through month four, as they just became uncomfortable at that point even if still fitting me ok. I found that high-waisted jeans were more flattering and actually less constricting than mid to low rise, as they buttoned above my belly, and the jean fabric stretched over my stomach (key here is to go for ones with stretch). A tee tied at the waist creates attention at your narrowest point, and is flirty and fun – so when paired with a high waist on the jeans, it’s a rather comfortable combo. Shift or tunic dress + fun necklace + sandals/booties. A shift silhouette is straight and roomy, but not too spacious and wide – so it doesn’t necessarily look like a “pregnancy dress”. The key is picking fabrics that drape well and don’t cling – so as to have the extra space without too much definition. I like ones with interesting details or necklines – also creating visual interest distracting from the stomach area. I’ve tagged some examples of the silhouettes I’ve described (please see shoppable options below); and overall, the key is to try to make your wardrobe work for you in those first three months, as you are not yet ready to purchase maternity wear (nor do you have the need for it). On that note, I wanted to share with you guys that I just launched a Maternity Styling Package, called “Most Stylish Mom-to-Be”, which helps you get through this special time in your life with great poise, style and flair. Check it out, and stay tuned for my upcoming blog post on what maternity styles should definitely be on your list, when/where to purchase them, and how to put them together with your existing pieces. Love these options and love how you wore the yellow and purple! So cute! 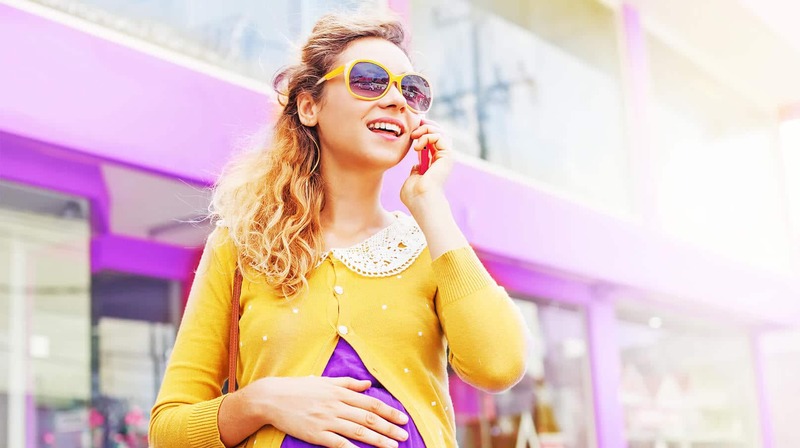 Very cute ideas for women to remain stylish during their first trimester! What a fabulous post for all those mamas and mamas to be out there! Love your approach to fashion and style lady.